By increasing the likelihood of your LinkedIn InMail receiving a response, you can increase your opportunities in a professional sphere. InMail has all sorts of uses for any of us working in the marketing area. The foremost of which is that it allows you the chance to reach out to people you may otherwise find hard to get in touch with. Let’s take a look at how to optimise and use it to its fullest. 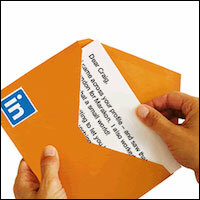 There’s little or no point getting in touch with someone who uses LinkedIn very irregularly. The signs are there if you look. Generally people with a sub 50 connection and no updates are not prolific LinkedIn members. Sending an email to an active user will have more chances of being read than someone who doesn’t use the medium – keep this in mind. Think about how you would want to be approached by a near complete stranger on LinkedIn. Asking someone to vouch for you in a professional area without meeting them is not apt, for instance. LinkedIn is a conversational starter. Just like in real life, most people will ignore you if you come on too strong, so try and use a little flattery in a subtle manner to break through their boundaries. Being short and sweet in emails and not just LinkedIn emails is the best way to get people on-side. Nobody wants to read a whole page of in-depth email, especially if they barely know you. Keep their motivation up by using LinkedIn questions short and actionable. Commenting on a post they’ve made can often be a good way to engage. Then, perhaps ask for a 10 minute phone call politely and see if they respond. So, where do you think most people will go after you contact them via InMail – your profile, of course? In such a scenario you should ensure that your LinkedIn profile looks completely up to scratch professional in its presentation. If you don’t look the most professional or interested you may never get a reply. So, the moral is – pimp your profile. People often have a raft of information online that can be used to contact them and doing a little detective work can help here. Reaching out to someone else via another means often means they will be faster to respond, as they may use that medium more. Secondly, it also means that you are preserving your InMails for important times when they are needed and you can’t get in touch with people in any other manner. InMail is a great way to get in touch with people is a great way to facilitate communication. However, it’s a necessity that they are used properly and that they are not thrown away flippantly. Simply because you have access to them doesn’t mean you should use them without selection and wisdom. Following the five tips above should see a higher rate of response and more success. Looking for a career in social media marketing? Take a look at our careers page or get in touch to find out more about our services.